Westmead Hospital Professor David Gottlieb announcing the trial. Leukaemia and lymphoma sufferers will have access to a potentially life-saving cancer treatment using genetically modified immune cells, courtesy of an Australian-first clinical trial out of Westmead. A team of researchers and clinicians from Westmead Institute for Medical Research (WIMR) and Westmead Hospital, led by Professor David Gottlieb, recently received final TGA and ethics approvals for the trial – the first of its kind to be approved in Australia – with phase 1 clinical trials set to kick off in August 2017. The trial will use a Westmead-designed gene-altering leukaemia and lymphoma treatment, enabling immune cells that have been genetically engineered to hone in, and attack, tumors. Announcing the trial today, lead researcher Dr Kenneth Micklethwaite said he hoped the treatment would benefit patients with otherwise incurable blood cancers, offering them access to effective treatments, currently unavailable in Australia. Westmead Hospital Dr Ken Micklethwaite. “This new approach to cell and gene therapy for cancer is exciting because it harnesses the power of the immune system to fight the cancer. The treatment involves collecting t-cells, a type of immune cell, from a simple blood draw and then genetically engineering them in a laboratory to produce special receptors on their surface called chimeric antigen receptors (CARs). Former leukemia patient Dr Mark Walsh. These engineered CAR t-cells are then infused into the patient, and with guidance from the newly engineered receptor, the cells recognise and kill cancer cells that carry the antigen on their surfaces. Westmead Hospital head of cell therapies Professor David Gottlieb said he hoped the new trials would finally give Australians access to this kind of treatment – at a fraction of the cost of similar treatments being developed internationally. “While initial trials conducted in the US have been highly encouraging, these trials are inaccessible to Australian patients, except those willing to travel overseas and pay up to $1 million,” he said. “This trial is exciting for Westmead as our trials are built on home-grown research, and our CAR t-cells are developed through an entirely Australian-based manufacturing process. 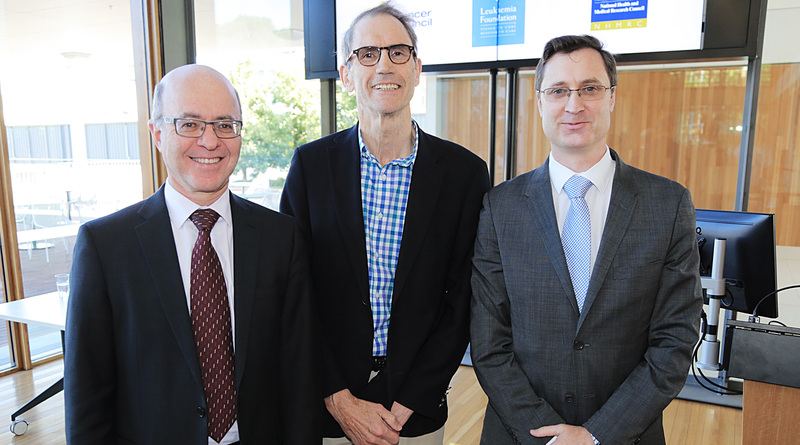 Professor David Gottlieb with former patient Dr Mark Walsh and Dr Ken Micklethwaite. The new trial is part of a series of trials, conducted in Prof Gottlieb’s research group at WIMR, aimed at strengthening immunity to infection in cancer patients receiving chemotherapy and other toxic treatments. Patients who may be interested in participating in the trial should speak to their GP or specialist about their suitability.